Few days since the first acts of vandalism appeared on the property of Church of Mystra Halron makes his way to Sorcerous Sundries during daylight. Those that might catch him outside the church would note a faster pace than ususal and thoughtful expression evident on his face. 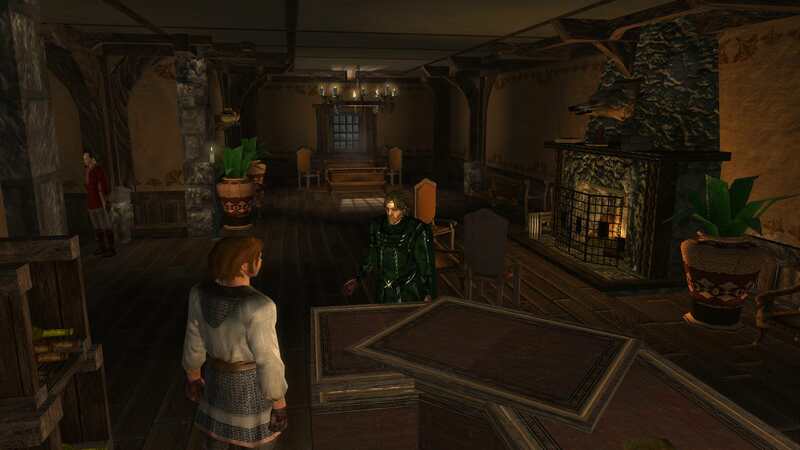 Inside the store he converses with Halbazzer of the recent events a moment, before ordering an unsual amount of his usual supply of parchment and other materials for porpuse of research. Amount is evident to last a longer time. 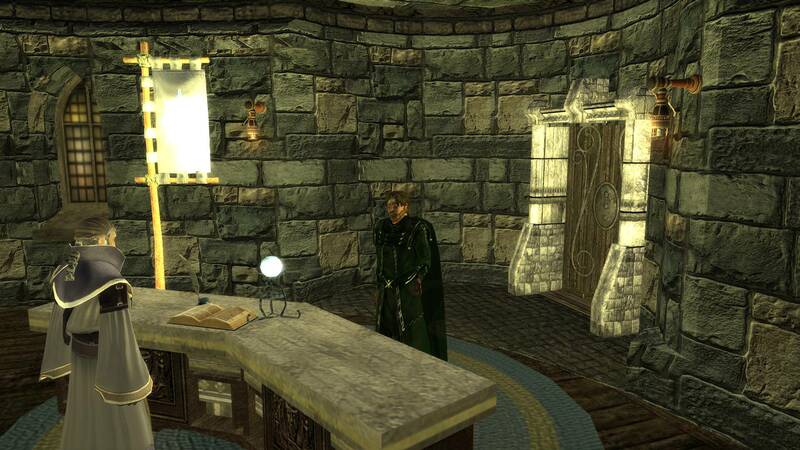 The green robed wizard would make his way back to the temple to drop by his supply to the private quarters and again head outside. This time to enter the Blade and Stars Inn. There he would order a supply of food and drink from Hester the Innkeeper to be delivered to the temple next door. He would leave the inn with a bought crate of white wine and disappear to the depths of the temple. After dark those with the ability to see the invisible and be present at the right time might catch the wizard taking one or more short routes around the property. He stops to inspect the walls and surroundings cloaked with his invisibility spell. Should he be companied by his brethren he would cast the concealing spell on them aswell. After the route he would disappear inside the temple and only emerge on pressing errand or business, but remain in the city or the outskirt for now. As he walks swiftly down the streets the air about him is kicking wildly about stirring up the dust leaves and random bits of parchment that are strewn about the dirty city streets. His mind is set on a certain place in the Noble district the Shelf of Many Books. Each step hits the pavement with purpose until he comes upon the bookstore. The door creaks open as a brief wash of air enters the store when Danny enters. He gives a small half smile best he can with so much on his mind. A brief conversation with the proprietress in which Danny explains he is looking for some books concerning knowledge on the Hells, Devils that reside there, the summoning, binding and banishing of devils. He also mentions he is looking for specific information on Mammon and Mephistopheles and their cults as well. Understanding the odd nature of his request Danny then promptly pays the store in gold bars however many she would request to keep this quiet for now. "We should take the army head on!" "... it sounds like a terrible idea, but look at that smile." "And he just sounds so confident ... he is a favored soul." In the late afternoon, Mi-Le, a bespectacled monk of the Old Order, takes a seat on the steps leading up the platform in the East Gate District. He sits quietly for a while, watching people pass by, noticing those who stop to pay attention, and exchanging pleasantries with those who greet him. As the sun begins to set, the monk publicly addresses those who are present. His voice is gentle but clear, full of tranquil confidence. "By now, many of you have perhaps heard of last month's graffiti on the temples: 'The Gods Have Failed.' Some of you who have experienced suffering recently might even agree with the message. "You might know that as a monk of the Old Order, I do not worship the gods. The Old Order did worship a god once, in ancient times. But that god died long long ago, and so we had to fend for ourselves. So perhaps more than anyone, a monk of the Old Order can understand the sentiment behind the message 'The Gods Have Failed.' Sometimes it seems that way, doesn't it? "So what's the alternative? If the gods have failed, what do we do? Well, my monastery teaches self-reliance. Ultimately, we are responsible for ourselves. No one can purify us or corrupt us except ourselves, our own choices. We, and we alone, determine what we allow to influence us. We can choose what we surround ourselves with, what we pay attention to and value. If one friend encourages us to do good deeds while another friend tells us to be wicked, only we can decide who we will listen to. So do we surround ourselves with good friends and positive influences? Or will we spend time with people who encourage our bad habits? "My teacher once said that admirable friendship, admirable companionship, admirable camaraderie is the whole of the holy life. When a monk has admirable people as friends, companions, and comrades, he can be expected to develop and pursue the Way. So we must choose our friends wisely. With this in mind, I would encourage us all to take another look at the gods. As a monk of the Old Order, I cannot say that the gods are perfect and eternal; surely they are not. But a self-reliant person who chooses his influences wisely should consider the value of the gods. Because the gods can be our greatest teachers, our best friends, the finest examples of the values which we hold dear. "Those of you who suffer daily, who wonder when your trials will end, look to Ilmater and His followers for an example of unyielding resilience. In Ilmater's temple you will find those who will share your burdens. Those who seek the strength to protect family and friends, look to Helm and His followers for the discipline and resolve you will need to stand against the cruelties of the world. Those who are heartbroken, seek Sune and learn about true selfless love from Her followers. Those who have had enough of the violence and hatred in the world, cast aside your weapons and seek Eldath in the silence of a peaceful glade. "Think back to the people who have been true friends do you. You might find that a true friend does not try to stoke your fears and resentment. A true friend encourages your noble qualities and helps you become a better person. "I offer these words for your contemplation. Go in peace, friends." The monk stands and bows to anyone who is listening. He then departs quietly. Danny bursts through the door to the Gond temple and quickly he locates Peter Pike and saunters up to him with a smile. He greets Peter and explains he is from the Darius Trading Company and that he was here on official business for Lord Luke Darius himself of Baldur's Gate. He spends the next few hours talking extensively with Peter about how alchemical silver weapons are made and what materials are needed to do so. He then asks Peter what the cost of getting a massive order together might be and how long it would take for such weapons to be made. Danny stops back in to the Shelf of Many Books and is seen having a conversation with the shopkeeper again what they were talking about only he and the keeper know. "I was told about the oozes by another adventurer. And I am nay an expert on the behavior of oozes... but it does seem odd that such an event would occur. It can nay be coincidence, aye? 'What power is behind this?' is what I want to know." The 'magi' also asks about the orphanage near the Temple. He donates 1,000 gold to the orphan's care, in what seems like an uncharacteristic display of charity. "My childhood in Thay was quite harsh. I would nay see these children's lives be so." Malign Ashmeddai, tiefling and "Fellblade"
Ilzsa Murnyethara, tiefling and "Hexmage"
Danny leaves the confines of the Minstrel's Muse and with a skip in his step he makes his way to the Elfsong tavern and over the course of the next few days also to the Friendly Arms Inn. At each establishment he speaks with the owners attempting to book each as a venue for some type of upcoming traveling minstrel's show. Those who listen closely hear one name of import mentioned in the conversation that of Lord Luke Darius himself was inquiring to each venue. 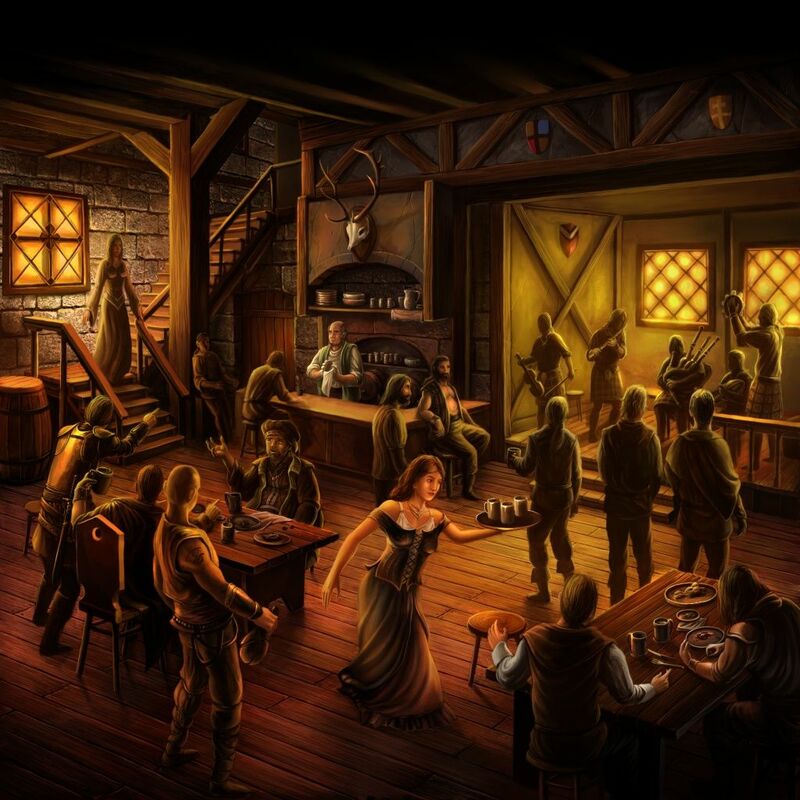 At the Elfsong Danny makes it clear they do not intend to book the interior of the tavern but the outside patio for performance. A tall, grey-robed Ffolk lass has begun to explore the farmlands in an attempt to chase up the various reports of plague. She speaks with local farmers most of all, moving from farmhouse to farmhouse in an attempt to locate any known sources of this cursed sludge. She does not seem to have encountered or know about the patches of darkness in the wilds, and thus her enquiries do not concern that matter in the slightest. Yet. Strange new afflictions have begun to appear in the farmlands, as the corruption previously held off begins to change. Flaming Fist patrols warn citizen and traveler alike to keep their distance from the afflictions, as they are very dangerous. Fortunately, the hazards are still fairly rare. Black, cursed sludge has begun to appear in areas where water once flowed, such as wells, streams and small ponds. Exposure to this sludge inflicts 1d8 Strength damage a round. If a character instead ingests the sludge, for some reason, it deals a full 8 Strength damage. Characters reduced to 0 Strength from the sludge are killed. Characters killed in this way cannot be raised by Raise Dead, and instead require Resurrection. Small patches of darkness, bathed in lethal cold have begun to appear in isolated areas of wilderness. Exposure to the areas of lethal cold deal 10d6 points of damage a round. Half of this damage is Cold damage and the other half is Unholy damage. Malign Ashmeddai was seen carrying a bucket, covered by a thick cloth. The tiefling wears thick gloves, and takes great care to not let the cloth fall off the bucket. If asked about it, Malign responds,"I am taking this bucket of sludge to a cleric. Don't touch!" mrm3ntalist wrote: A hooded figure exits the magical portal, by the pillars on the Boareskyr Bridge. A pair of silver longswords are carefully strapped on his back along with a quiver full of silver arrows. On his side, a bear lazily follows his every step from a short distance. After setting a couple of alarm spells in the near vicinity, the ranger sets camp on a hill overlooking the Dragonspear Castle. He spends some time observing from a safe distance the spread of the devils before sitting by the camp. He procures the necessary reagents and casts a Commune with Nature spell. * At about the same time as the Hooded figure is seen exiting the portal, it is told that a huge female dragon was seen flying over head of Misty Forest. The hidden Rangers that the Elders ordered to secure Misty Forest, if asked or even seen for that matter, would know this particular Dragon very well. Once she fully circled the southern & southwestern half of the forest, she was seen flying South at a very fast pace then disappearing into a hidden forest grove. Once inside the Druid Grove safely, she shifts back to her tiny Elven form. The Archdruidess seems to be waiting for something or someone. DM Impostor wrote: The lass would be able to find a few instances of the cursed sludge. The first few would be easy to find, as they would have a pair of Flaming Fist guarding it, to prevent locals from harming themselves. Others would simply have a warning sign, while more remote instances could be found with some walking, free of warnings or locals. Having been relatively successful in finding various sources of the foul blight, the woman later returned to Baldur's Gate. She visited Maltz' weapon shop and bought a 10ft pike haft, a two-foot cast-iron rod, and further inquiries about some silver weapons. In all likelihood, due to the abundance of rumours of devils up north, there was probably very little silvered weaponry left, so she would have provided a sum of her own silver coins to be melted down into a spear tip, or, if that were insufficient, a thin silver rod with a sharpened point. She also bought a cold-iron spear tip of dwarven manufacture. Her next stop was Sorcerous Sundries where she purchased a single vial each of Alchemist Fire and Acid. Lastly, she stopped by Aello's to purchase a bolt of old cloth, something suitable for tearing into long strips. Word darts quickly through the Chapterhouse in the wake of peculiar events surrounding the Farmlands that a frozen wasteland has been revealed nearby, centered upon a lone farmstead and extending outward from it in an impenetrable sphere of cold. Grand Knight Al'maire relays the dangers that stalk the areas just around this sphere, namely icy undead, twisted elementals and corrupted wildlife in great numbers. He also relays word from Flaming Fist Captain Ushra that it seems the destruction of several devices found within the Farmlands may have forced some layer of magic ward to have peeled away from the vicinity, thus revealing the wasteland at their back door. He advises caution should anyone attempt to approach its boundary and any ideas of how it might be breached to be delivered to him promptly. The strange blue-black shimmer above the Baldur's Gate farmlands fades, as strangely as it appeared. A section of farmland, deeply frozen as if caught in a terrible, endless winter has appeared near Baldur's Gate. The region seems to encompass what was once the Ransell farm, an unassuming local farm, and the surrounding woodland. The Flaming Fist are quick to surround the area with guardsmen, but are unable to venture within due to the intense chill. An unholy cold infuses the region. Those who enter the region take 10d6 points of cold damage a round. Half of this damage is unholy damage, and cannot be reduced. Scouting the area proves impossible due to the cold. Those who try take 21,000 points of damage over the period of an hour. Those with access to cold immunity for the hour only take 10,500 points of damage. Those able to heal that much damage over the period of an hour, learn what the spot check learns, albeit through more close encounters. Reilan and Tif Ransell have lived and worked at the Ransell farm for over forty years. Locals report them as friendly, but quiet. If pressed, none can recall ever actually having visited the farm at any point in the last four decades, always having remembered other business before venturing towards the farm. The region seems deeply frozen, but life of some sort is visible in the frozen woodland. The keen eyed can spot misshapen wolves, ice elementals, and what appear to be the dark outlines of shadows within the frozen wasteland. The frozen region appears centered on the Ransell Farm itself. The cold gripping the Ransell farm appears to be consistent with the Hellish eternal winter of Cania, domain of Mephistopheles. 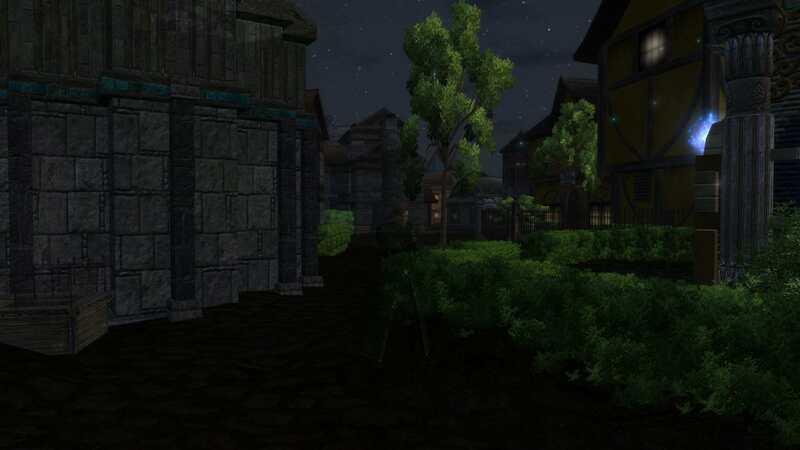 Malign is seen heading towards the Ransell Farm. Arriving there, he speaks with the Fist soldiers there. "I am a scholar of the Planar. And that does nay seem as normal ice. May I study it, from a distance?" Following the destruction of Soubar and the dwindling of Ebon Blade forces due to the attrition at the hands of the Troll and Devil army, Orcs begin to rampage the former trading center in the north of the western heartlands. Several Ebon Blades are laid low before their onslaught, retreating to the protection of their fort. The Ebon forces attempt to consolidate their strength.........things look dire! I rose very early, and when I stepped out into our Courtyard, it was long before the Sun began to chase the darkness of the Night away. As I stepped thru our gates I heard Lady Gina exit the keep behind me. We did not tarry for long in front of the Keep, and was soon on our way towards the Field of the Dead, our launching point into our investigation. Once we arrived we were soon met by Miss Mercy and Mr Varan. Eager to join our investigation. Everyone took a knee for a momentary rest before we left and then we cast our protections. After I was satisfied everyone was well protected we embarked on our journey. First stop, the battlefield of the Fields of the Dead. Upon arriving it was a gruesome sight, not for the weak of stomach or the feint of heart. Decaying and half eaten bodies of trolls everywhere for the eyes to see. The stench was almost overwhelming. Upon inspection of the bodies, nothing remarkable was found, other than the piercing wounds that were left on what was left of the bodies. I had heard reports that the Helmite Hell Riders had been thru here. The evidence left was that they were thorough with their elimination of the trolls. The curious thing we found, was that these Trolls wore armor. As we soon found out by being confronted by a few remaining stragglers that were left behind. They were eliminated to bother no one, no more. I then ordered Squire Jerel, who had joined us by this time, to burn the remains of all that was left of the bodies. Unfortunately the bodies seem to be resistant to Fire. So Squire Jerel did so with the use of acid, which work well for our purpose. With nothing more to do here, we moved on to the Troll Claw Hills. The Troll Claw Hills is where the resistance began to intensify, which is of no great surprise. But what we encountered was. As we entered the Troll Claw Hills we were Joined by two Members of the EDE, Mr Kael and Miss Ithilwen. We entered the Toll Claws from the West and in doing so we were attacked from above by another patrol of trolls armored and advancing. They were dispatched without much problem. We proceeded towards the East and we didn't make it far before again we were attacked again. The makeup of our next attackers was interesting. Not only were they made up of Armored Trolls but there were also Beasts from the Shadow Plane, and a few small demons. Again quickly dispatched and will no longer be of trouble to anyone again. As we made our way to Kraak Helzak we came across Armored trolls, beasts from the Shadow Plane, Demons, Divine weilding Trolls, Orcs, and Spirit Ogres. All fighting alongside with each other. Once we made it to Kraak Helzak, we stopped for a few moments to rest and recast our protection, it is then I heard a friendly and Welcomed voice in the air. Mr Mendel came to our aid and joined with us. Mendel took up point and scouted for us as we continued with our patrol. We made our way towards Soubar. Fighting our way thru the many patrols that stood in our way. It should be noted, that the closer we got to the Boareskyr Bridge and Soubar, the heavier the resistance was. And we did search the corpse we laid ti rest as we made our way East, but nothing of note was found. We finally reached the Boareskyr Bridge. It is here we met with the heaviest resistance. We immediately went into formation. Melee fighters in front, archers and magic users behind and healers to the rear. We created a wall to not allow penetration and let the magic and arrows do their toll on what laid siege to us. We faced everything from Goblinoid Worg Riders to ooze, to orcs, to demons and shadow plane beasts, to trolls and troll Rangers. Troll Rangers, watch out for these beasts, they have heavy damage reduction magics on them, and do powerful damage. Our line held for many waves of these creatures after they attacked and attacked again and again. The bodies piled high enough that it began to create a natural barrier they they would first have to climb before reaching us. Finally the waves subsided. And we had a chance to retreat and recover from our wounds. We then proceeded to Soubar. It is my estimation, the intent in these waves of resistance we encountered was to detour us from reaching Dragonspear Castle. It is the direction in which they seemed to be coming from. I now know it would be a dereliction of duty for us not to get involved with what appears to be an invasion of the coast. Our allies must be contacted and a plan of action formed between us. I would like to commend each and everyone of the Brave souls who accompanied me on this mission. Each one of these valiant souls fought and followed orders with great discipline and fortitude. It is to them I give my congratulations and gratitude.